Observation - Flock of Skylark - UK and Ireland. 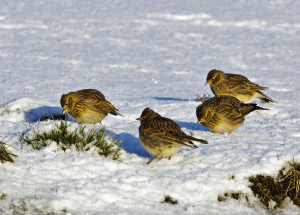 Description: This is a small part of the 24 strong flock of skylark at RSPB Saltholme. Most of the water around the reserve was totally frozen. This is a small part of the 24 strong flock of skylark at RSPB Saltholme. Most of the water around the reserve was totally frozen.